In 1997 national governments agreed to adopt the Kyoto Protocol to the United Nations Framework Convention on Climate Change as a legally binding framework to reduce emissions of greenhouse gases (GHGs) (Sanz et al., Chapter 24, this volume). Although a number of GHGs are relevant, carbon dioxide is of overriding interest in part because of its sequestration in living organic matter that can be managed to regulate eventual fluxes to the atmosphere. The Kyoto Protocol has a predominant focus on the role of forests in carbon sequestration, but there is broad agreement in the science community on the need to understand the entire carbon cycle (Falkowski et al. 2000)—terrestrial, ocean, and atmosphere—and use these components in complementary and synergistic ways. A comprehensive and systematic approach to carbon accounting would provide countries with the accuracy and consistency they need to monitor and manage their carbon stocks in the context of national, regional, and global efforts to mitigate and adapt to the effects of climate change. In addition to the focus on forestry, such an approach would require satellite and in situ observational data for land uses such as cropland and grazing land, wetlands, and coastal areas so that such information can be reflected in national, regional, and global carbon budgets (Cihlar 2002; Cihlar and Denning 2002; Cihlar et al. 2003). With the exception of the service sector, all international commercial trade involves a transfer of carbon. The value of all global exports in 2000 was US$6,186 billion of which mining was US$813 billion, manufacturing US$4,613 billion, and agriculture US$558 billion (WTO 2003). This chapter focuses on transfers of carbon that take place between regions in the form of imports and exports of agricultural and forest products such as cereals and wood pulp (see Appendix 21.1). Although the economic dimension is significant, it is not addressed in this chapter. Furthermore, this chapter does not address the question of how credits (or debits) related to trade in products with carbon content could be applied in carbon accounting frameworks. The intercomparison of a number of global ecosystem models indicates that approximately 55 petagrams of carbon (PgC) is generated each year in the form of net primary production (NPP) in terrestrial ecosystems (IGBP 1998). This production takes place on a global land area of 134 million square kilometers (km2) (FAO 2003) consisting of forests and woodland, croplands, grasslands, and other ecosystems. Approximately 15 million km2 is arable land in use at various levels of cropping intensity, ranging from rain-fed systems with low levels of external inputs to irrigated systems with high inputs. An estimated 3.5 PgC are produced annually just by agricultural crops, accounting for about 7 percent of the total NPP in terrestrial ecosystems. Of this amount, approximately one-third is the harvested product. About half of the harvested product is used for direct human consumption and half for animal consumption (Goudriaan et al. 2001). • Land use and cropland data were used to derive estimated long-term changes in global cropland areas that were then validated against a satellite-derived potential vegetation data set (Ramankutty and Foley 1999). • Crop production data for 16 major food products were used to estimate horizontal carbon transfers (through trade) in agriculture. The data were converted to carbon equivalents to arrive at an estimated "displacement" in excess of 1 PgC per year (y-1) (Ciais et al. 2001). •Agricultural production statistics for 1991 were used to estimate the NPP of arable land by using fixed crop-specific coefficients that included dry matter content, harvest index, root production, and carbon and nitrogen content (Goudriaan et al. 2001). The most relevant data on international trade of forest products appear in Michie and Kin (1999), which analyzes global trade flows of major forest products in six regions between 1983 and 1996, based on the UN ComTrade database. This comprehensive effort includes trade flow summaries and illustrated regional charts, maps, and spreadsheets. With the partial exception of forest products, little attention has been given to analyzing the quantities of carbon that flow annually between regions in the form of exports and imports. Potentially, a large number of items could be included. The UN Standard Industrial Trade Classification (SITC) scheme (United Nations 1986) uses a global framework with 10 categories for national export and import data (Table 21.1). paper, fertilizers, and various kinds of agricultural machinery. Crude materials, fuels, chemicals, machinery, and manufactured goods are other relevant categories. Carbon conversion coefficients have not been developed for most of the products in the SITC framework. Although in many cases the carbon content may not be sufficiently great to justify their inclusion in an accounting framework, more analysis is needed to ascertain the potential magnitude of the carbon content, the significance of trade in these items, and the viability of developing coefficients. There is a wide variety of agricultural and forest products for which trade data are publicly available, measured in both quantity and value (Table 21.2). Of primary interest to the carbon science community are the volumes of carbon-based products that are transported through international commerce and their spatial and temporal distribution. The primary sources for data related to commerce in agriculture and forestry are from the Food and Agriculture Organization of the United Nations (FAO 2003) and the UN Statistical Division database for commercial trade (United Nations Statistical Office 2003). The ComTrade database has several advantages. Foremost is the ability to quickly extract, manipulate, and display trade data in a variety of different ways. The agriculture and forest content is built primarily upon statistical data collected and managed by FAO. It is further supplemented with data from the Organisation for Economic Co-operation and Development (OECD) and selected other international sources, including the World Trade Organization (WTO) and the European Union (EU). 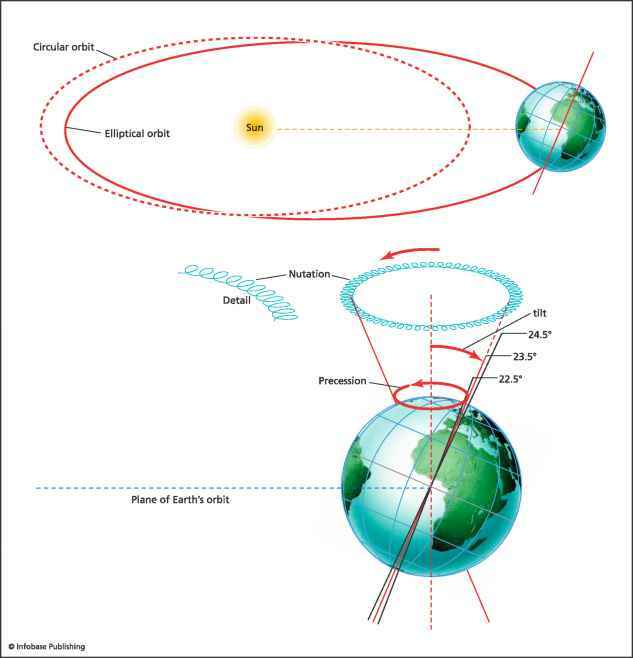 The most complete and reliable data at the global and continental levels are available only for the period since 1989. Longer time series could be helpful in projecting regional and global trends with better accuracy and temporal composition for individual crops and commodities. The ComTrade database does not aggregate trade quantities to higher levels, such as the two-digit group (represented by cereals, e.g., code 10), because of possible error arising from the use of different measurement units at the basic reporting level. Thus, estimates in this chapter have been derived manually from the four-digit groups (which includes wheat and rice, e.g., codes 1001 and 1006). Conversion rates for estimating carbon content of biomass rely primarily on the work of the Intergovernmental Panel on Climate Change (IPCC) in its assessment reports. A conversion factor of 45 percent was used to estimate the net dry amount of carbon in an agricultural crop that was made up of carbon. The figure of 48 percent may be more representative for the cereal group but would make little difference in the results (see Appendix 21.2). For forests and wood products, a conversion factor of 50 percent was used. The accuracy of the carbon conversion factors is also assumed to be independent of production system. Specifically, countries that use high levels of external inputs such as fertilizers, pesticides, and conventional energy tend to produce crops with the same "embodied" carbon content as lower-income countries that use much lower inputs. The embodied carbon contained in the cereal and wood products reflects only a portion of the total carbon consumed in producing, harvesting, and transporting those products. This additional carbon, consisting of fossil fuels arising from indirect sources, is (or should be) captured in National Greenhouse Gas Inventories (NGHGI). Although this additional carbon is probably not significant in calculating flows at the regional and global levels, the same may not necessarily be true at the national level, where the performance of individual countries in managing and accounting for their carbon stock changes takes on added economic and political importance (see Appendix 21.3). region to its underlying countries and then summing the returned results. This approach means that the total trade from a region to a partner may be less than the total flow, as intraregional exchanges are included. For example, exports and imports from North America to North America mostly reflect trade between the United States and Canada. understood but may arise largely from differences among national reporting and accounting systems. During data processing ComTrade estimates quantities (trade quantities and net weight in kilograms) at the six-digit level (e.g., durum wheat, code 100110) of the classification system and the four-digit level (e.g., wheat, code 1001). If, in the aggregation of quantities, there is a conflict in the quantity unit of measure, they follow the rule that "if the value associated with one quantity unit equals 75 percent or more of the total commodity value, then that quantity unit will be chosen as the unit of the given commodity and the remaining quantity will be estimated according to the proportion of its value." A "not reported" quantity is treated in the same sense and the quantity unit left blank. This chapter concentrates on the cereals, paper products, and wood products groups (see Appendix 21.1 for group definitions). Cereals include all coarse grains as well as rice and wheat. At the regional and global levels, this group is clearly the dominant one in both economic value and total trade volume. The group components tend to be homogenous in terms of the carbon content of the harvested product, which can range from 47 to 52 percent (Strehler and Stutzle 1987). These three groups represented approximately 3.8 percent of total global trade value, and cereals represented 5.3 percent of the total trade value in agricultural products in 2000 (Table 21.4). Based on ComTrade data, exports trade in cereals, wood products, and paper products was approximately 0.370 PgC in 2000 (see Table 21.4). North America led in the export of cereals (0.049 PgC), and Europe led in the export of paper and wood products (0.046 PgC and 0.071 PgC). If cereals (i.e., small and coarse grains) represent 60 percent (0.735 PgC) of the total NPP of harvested agricultural crops (1.225 PgC) then the carbon in cereal exports (0.105 PgC) represents 14.3 percent of the carbon content in global harvested cereal products (Table 21.3). If we consider the total NPP of agricultural harvested and nonharvested crops (3.5 PgC), then exported cereals represent 3 percent of the carbon content. in live and dead material, representing more than 55 percent of the global carbon stored in vegetation (Niles et al. 2002), and have an estimated NPP of 45 PgC per year. From this base, exports of paper and wood products (0.265 PgC) represent a very small fraction (0.6 percent) of the carbon content in forest and woodland. Asia, Europe, North America, and Other America are the main exporters of cereals, representing 98 percent in volume and value (Table 21.4); Europe and North America account for three-quarters of that trade. Data consistency was cross-checked by calculating the price of a kilogram of cereals. The price ranges from 0.113US$ kg-1 in Other America to 0.160US$ kg-1 for Asia, from the world average of 0.127US$ kg-1, broadly conform to the weight volume figures. In the year 2000 North America exported 0.049 PgC of cereals followed by Europe, Other America, and Asia (Table 21.5). The three major flows are the exports from North America to Asia and Other America and intracontinental trade in Europe. These fluxes represent more than half (52 percent) of the global carbon flow in cereals. North America alone accounts for 40 percent of the total flow just in its exports to Asia and Other America. A central issue in agriculture and forest carbon commerce is the net position, the sum of total imports and exports. In 2000 North America was the largest net exporter of carbon for cereals (0.046 PgC) leading Europe and Oceania, which are small net exporters with 0.006 and 0.001 PgC, respectively. Asia and Other America are clearly net carbon importers. Africa is a net carbon importer for cereals but becomes a net exporter of carbon when wood products are considered (see Figure 21.1). North America and Europe have been net exporters of carbon since the first data sets in 1989, while Asia has been a net importer (Figures 21.2, 21.3, and 21.4). The trend since 1992 for North America (Figure 21.2) is stable with a net carbon export fluctuating between 0.040 and 0.050 PgC for cereals. Paper and wood products are also stable and less than 0.010 PgC. 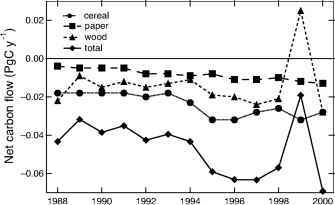 In Europe (Figure 21.3) the net balances in cereals and paper products have been relatively stable since 1996. 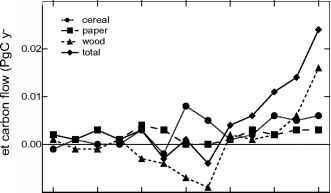 Wood product balances, however, increased steadily from 1997 (0.001 PgC) through 2000 (0.016 PgC). exporter, the data are stable for the period 1989-2000. Asia is a net importer of carbon for all three commodity groups. FAO projects that cereal exports will continue to grow for the foreseeable future, as developing countries find it more efficient to import from lower-cost producers for a portion of their overall food needs (Bruinsma 2003). This trend implies (assuming constant climate change) that the present net exporting regions—Europe and North America—will further expand their present positions, possibly at growth rates exceeding 1 percent per annum. Global cereal production is projected to rise from 1.86 X 109 tons in 1999 to 2.83 X 109 tons in 2030 (Bruinsma 2003). At that rate, exports of cereals would represent only 7.6 percent of the 2.1 PgC produced yearly by cereals in 2030 but a fifth (21.7 percent) of the harvested cereal product (0.735 PgC), assuming that NPP does not change. bon importer or carbon exporter) could have a significant bearing on its reporting to the Conference of the Parties of the UN Framework Convention on Climate Change (Sanz et al., Chapter 24, this volume). Under such conditions, it may be worthwhile to expand the analytical framework to include a wider variety of carbon-based products beyond the agriculture and forestry sectors, such as manufactured goods, chemicals, and other significant sectors. at US$14-US$23 per ton (Brown 1996), far above many of the prices (US$3-US$5 per ton) that have been used to date in various sequestration schemes. Higher prices could provide incentives for countries to assess potential carbon gains and losses from imports and exports. • Review possible differences in carbon content that may arise from technology, ecology, crop type, or variety. • Assess algorithms for calculating carbon content in different types of export crops, in light of the technological package used, ecology, and crop variety. • Further investigate the methods used to aggregate ComTrade data at the regional and global levels in order to undertake data assembly and develop reliable longer-term historical data for carbon commerce. • Clean the ComTrade data to ensure that quantity and value data are consistent. • Assess the feasibility and architecture required to develop a global carbon commerce database to analyze annual carbon commerce through queries using economic and tonnage data. Among the outputs could be calculations of the direction and velocity of flows, net carbon gains and losses, and country-to-country flows, as well as regional, continental, and global exchanges on and annual and decadal basis. • Collaborate with the climate modeling community to achieve better spatial accounting for net carbon flows in commerce through improved data structure and definition of model requirements. Cereals (ComTrade code 10) are composed of wheat and meslin, rye, barley, oats, maize, rice, grain sorghum, and buckwheat, millet and canary seed, other cereals. Paper products (ComTrade codes 47, 48, 49) are composed of pulp of wood, fibrous cellu-losic material, waste, etc., paper and paperboard, articles of pulp, paper and board, printed books, newspapers, pictures, etc. Wood products (ComTrade codes 44, 45, 46) include wood and articles of wood, wood charcoal, cork and articles of cork, manufactures of plaiting material, basketwork, etc. Primary crops (annual) consist of cereals, pulses, roots and tubers, sugar crops, oil-bearing crops, fiber crops, vegetables, tobacco, fodder crops. Primary crops (perennial) are composed of fruits and berries; nuts; permanent oil-bearing crops; spices, condiments, herbs; other permanents crops (e.g., cocoa, coffee, tea). Note: Table mainly based on Strehler and Stulze (1987). 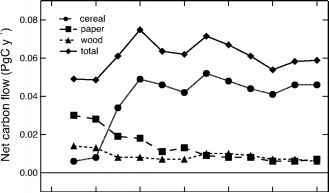 Sugarbeet data from Ryan and Openshaw (1991). Nitrogen content from Barnard and Kristoferson (1985). a Statistics are for beet leaves. Barnard, G., and L. Kristoferson. 1985. Agricultural residues as fuel in the third world. Produced by the Earthscan Energy Information Programme in collaboration with the Bei-jer Institute of the Royal Swedish Academy of Sciences. London: International Institute for Environment and Development (IIED). Brown, S. 1996. Present and potential roles of forests in the global climate change debate. Unasylva 185 (47): 3-10. Bruinsma, J., ed. 2003. Agriculture towards 2015—2030. Rome: Food and Agriculture Organization of the United Nations. Ciais, P., T. Naegler, P. Peylin, A. Freibauer, and P Bousquet. 2001. Horizontal displacement of carbon associated to agriculture and its impact on the atmospheric CO2 distribution. Paper presented at sixth international carbon dioxide conference, Sendai, Japan, October 1 -5. Cihlar, J., ed. 2002. Terrestrial carbon observations: The Ottawa assessment of requirements, status and next steps. Environment and Natural Resources Report 2. Rome: Food and Agriculture Organization of the United Nations. Cihlar, J., and S. Denning. 2002. Terrestrial carbon observations: The Rio de Janeiro recommendations for terrestrial and atmospheric measurements. Environment and Natural Resources Report 3. Rome: Food and Agriculture Organization of the United Nations. Cihlar, J., M. Heimann, and R. Olson, eds. 2003. Terrestrial carbon observations: The Fras-cati report on in situ carbon data and information. Environment and Natural Resources Report 5. Rome: Food and Agriculture Organization of the United Nations. Falkowski, P., R. J. Scholes, E. Boyle, J. Canadell, D. Canfield, J. Elser, N. Gruber, K. Hibbard, P Hogberg, S. Linder, F. T. Mackenzie, B. Moore III, T. Pedersen, Y. Rosenthal, S. Seitzinger, V. Smetacek, and W. Steffen. 2000. The global carbon cycle: A test of our knowledge of Earth as a system. Science 290: 290-296. FAO (Food and Agriculture Organization of the United Nations). 1999. Prevention of land degradation, enhancement of carbon sequestration and conservation of biodiversity through land use change and sustainable land management with a focus on Latin America and the Caribbean. World Soil Resources Report 86. Rome. -. 2003. FAOSTAT (FAO statistical database). Rome. Goudriaan J., J. J. R. Groot, and P. W. J. Uithol. 2001. Productivity of agro-ecosystems. Pp. 301-313 in Terrestrial global productivity, edited by H. A. Mooney and B. Saugier. San Diego: Academic Press. Heath, L., and K. Skogg. 2003. Contribution of forest products to the global carbon budget. In 2003 national report on sustainable forests. Washington, DC: U.S. Forest Service. IGBP (International Geosphere-Biosphere Programme). 1998. Global net primary productivity. In GAIM, 1993—1997: The first five years: Setting the stage for synthesis, edited by D. Sahagian and K. Hibbard. IGBP/GAIM (Global Analysis, Interpretation, and Modeling) Report No. 6. Durham, NH: IGBP, Institute for the Study of Earth, Oceans, and Space, University of New Hampshire. http://gaim.unh.edu/Products/Reports/Report_6/index.html. IPCC (Intergovernmental Panel on Climate Change). 1996. Greenhouse gas inventory reference manual, Vol. 3, pp.4—75. Paris. Michie, B., and S. Kin. 1999. A global study of regional trade flows of five groups of forest products. Helsinki: World Forest, Society and Environment Research Program. Niles, J. O., S. Brown, J. Pretty, A. S. Ball, and J. Fay. 2002. Potential carbon mitigation and income in developing countries from changes in use and management of agricultural and forest lands. Philosophical Transactions: Mathematical, Physical and Engineering Sciences 360 (1797): 1621 — 1639. Ramankutty, N., and J. A. Foley. 1999. Estimating historical changes in global land cover: Croplands from 1700 to 1992. Global Biogeochemical Cycles 13 (4): 997-1027. Ryan, P., and K. Openshaw. 1991. Assessment of bioenergy resources: A discussion of its needs and methodology. Industry and Energy Development Working Paper, Energy Series Paper No. 48. Washington, DC: World Bank. Strehler, A., and W. Stutzle. 1987. Biomass residues. In Biomass regenerable energy, edited by D. O. Hall and R. P. Overend. Chichester, UK: John Wiley and Sons. United Nations. 1986. Standard international trade classification. United Nations Statistical Papers, Series M, no.34/rev.3. New York. United Nations Statistical Office. 2003. ComTrade (Commercial trade database). New York. http://unstats.un.org/unsd/comtrade/. WTO (World Trade Organization). 2003. Trade statistics. Geneva. http://www.wto.org/stats.